I want to start and (this time) finish the two Asimov series I have: the Foundation books (Trilogy in fact) and the Robots cycle. Is there a particular order between those two series or are they totally unrelated and can be read in any order? I think that neither published order nor chronological order quite does the series justice. Here's the order I think makes the most sense for maximum enjoyment of the books. You'll notice that I've left some out. The series was never quite finished, so I feel that a non-linear approach is the best choice here. This allows one to emphasize the building of themes within the books, rather than individual plot threads. At their heart, these stories work best when they focus on individual people. This may sound odd, as the robot and Foundation tales are meant to illustrate great sweeps of history, but in my opinion, the strongest tales here are those that are small and intimate. Think of Susan Calvin and the Mule and you may see my point. Similarly, the three "Empire" novels, set in the very early days of the Empire--they're not up to the level of quality that the other books achieve, and can safely be read after finishing the main series--if at all. Other books, like Roger MacBride Allen's "Caliban" novels, can be enjoyed off to the side, as they don't really forward the story arcs of the rest of the series. Rationale for this order is below. Spoilers for those who haven't read the series. "I, Robot" is a short, fun read, as is almost everything Asimov wrote. It was the first book of Asimov's that I read, and it's a great introduction to his work. Next, jump ahead in time and read the "original" Foundation trilogy. The reader will notice immediately the lack of robots in human society--what happened to the robots during the thousands of years in between these books? Now we jump back into the past, slightly after the events in I, Robot, and read the Robot novels. We see the harm that robots can do to a society where they are forced to preserve human life at any cost. The next step is to read the two sequel Foundation novels. Somehow, Daneel Olivaw has been behind the scenes for years. But how was this achieved? We'll find this out in the next book. "Robots and Empire" is the single book in the series that ties everything together, so that's next. Since Asimov never finished the Foundations series, this is the closest thing we have to a climax. Which is why I placed it here, and not after the Robot novels. The promise of humanity's future is a noble, optimistic one that we know will pan out imperfectly. The grand vistas of time stretching out at the end of this book show us that human history is cyclical, and that the nobility of human achievement is in the very act of us striving for something better. If you start with the fundation series you will end with a happy face (because of all the little spoilers on the robot series). If you start with the robot series, you will have a lineal understanding of asimov universe. 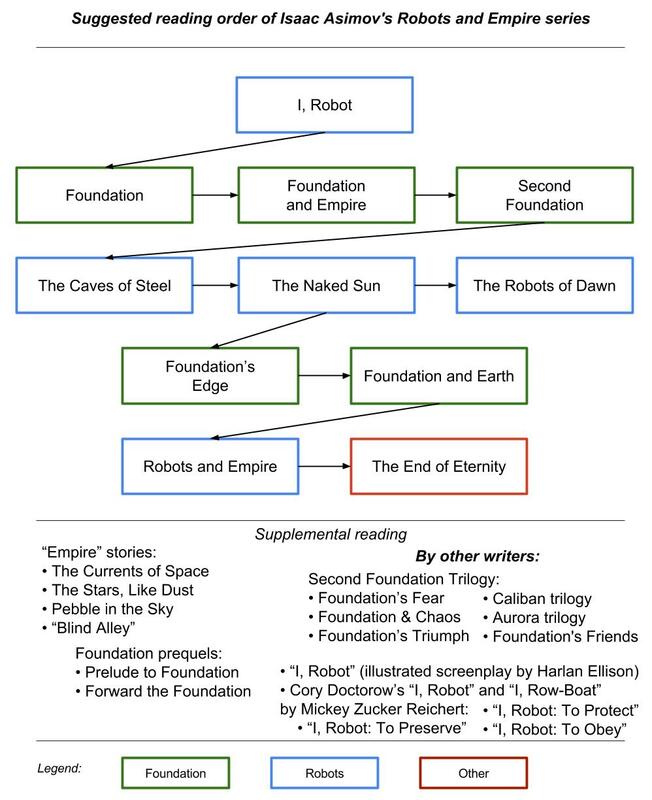 I've done it both ways and preferred reading in chronological order, except you want to include the empire series between the robot and foundation series. There's a lot of time between robots and foundation and the few short books of empire take place during that time. It gives a better understanding to how Earth was lost. Go for publish order. As the others have said, the universe is filled out with later books. And by the time you get towards the end of the series Asimov event starts bring in relationships to books outside the Robots & Foundation series. However they start to converge in the last few sets of books. I forget which ones specifically (5th Foundation? The one after Foundation's Edge I think). Sort of like Heinlein's universe-as-fiction notion to unify all his books. But Asimov did it a little bit cleaner I think. An order that has been working for me was to start with the End of Eternity. That's give you the basic understanding of how and why the galactic empire comes to be. Then I started The Foundation all the way to prelude. I read prelude last to give you More back story on Hari. Because of the reference to the robots in the last few Foundation books, I feel it brings a lot of exciting tie-ins when you start the Robot series. From there I read the Empire series. And then I finish at Forward to Foundation. My dad gave me the books in a specific order. I read the Robots books first (the series with Daneel). Then I read Foundation, Foundation and Empire, Second Foundation, Forward the Foundation, Foundation's Edge, Foundation and Earth and lastly I read Prelude to Foundation. I liked this order but in hindsight I would have re-read the first few Foundations before reading Prelude to Foundation, just to refresh my memory. I read End Of Eternity somewhere in between the Foundations but I don't really think that matters, beacuse it is not explicity linked with the Foundation universe, or it is not necessary to the storyline to understand this link. Not the answer you're looking for? Browse other questions tagged suggested-order isaac-asimov robots foundation or ask your own question. Are the Second Foundation trilogy and the Caliban trilogy considered Foundation canon? When does Foundation take place?